Healing from infidelity means first dealing with the reality of how to stop the affair. It is often the case that you cannot directly stop the affair. 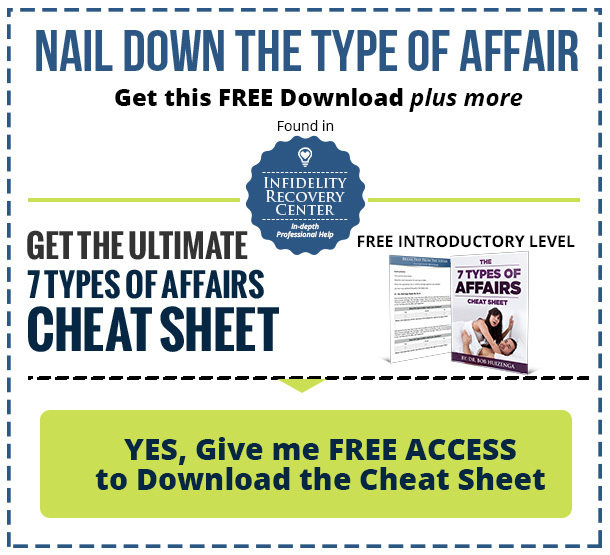 In reality, the harder you try directly to get your cheating husband or cheating wife to stop the affair, the more unlikely that the affair will indeed cease. Specifically for the affair type: “I fell out of love…and just love being in love” a direct assault most often results in the affair couple intensifying their contact or emotional involvement. But, you do stand a chance, and sometimes a very good chance of influencing the cessation of the affair if you are smart! Being smart means taking some time to stand back, assess the type of affair and then plan a course of action that might get you the results you want. Or, at least you will feel better about yourself, feel more empowered, by taking some calculated action. Now standing back for most is very difficult. The intensity of the pain and agony compels one usually to revert to old patterns that sometimes (most often probably) worked in certain situations to alleviate the pain (supposedly) and/or gain a measure of control. For example, when feeling the fear of being displaced or losing something vitally important, a person may lash out, become aggressive. Watch out! S/he externalizes the pent up feelings and energy. S/he rants and raves. S/he threatens (to kick him out…even though that is not what s/he truly wants), s/he pushes, prods, asks questions unendingly and begs, pleads, cries… all to no avail. The reactions triggers in the spouse a desire to flee. Or, the wounded spouse may use the tactic of internalizing and withdraw. S/he carries her pain within, may become depressed and assume victim role. Others are concerned about his/her mental and emotional health and what s/he might do. The loud message is: “care for me.” Out of guilt the cheating spouse may move close but there will be smoldering anger that will eventually destroy the marriage or relationship. And rest assured, these patterns will only generate more distance. Part of what I teach those impacted by infidelity is to step back and see the patterns. At that point one stops reacting (by externalizing, pushing and being aggressive or… by internalizing and playing the victim role), stands back, evaluates the situation and begins a quest to find that which WILL work in changing the flow of him/her self and ultimately influencing the nature of the affair. Let me give you a few examples of how this works. Affair # 6 is “I Need to Prove My Desirability.” There is an underlying belief of one’s relational and sexual inadequacy that goes back in time. Often the person encountered some form of sexual abuse of extreme sexual confusion as a child/teenager. When the wounded spouse discovers the affair s/he may aggressively approach the cheating spouse. There may be name calling. S/he may verbally assault him/her. There may be demands to stop the affair. The cheating spouse retreats into his/her feelings of inadequacy and the affair or sexual acting out may continue. The best chance for the wounded spouse to stop the affair is to listen. Yes, that’s right. Open the door so the cheating spouse can talk. Get at and affirm his/her sense of inadequacy. Easy? No. But, often well worth it. Once the wounded spouse stands back and learns, s/he realizes that the best strategy may be to back off. After all, this type of affair is based on an attempt to redo a stifled adolescent love life. And like an adolescent, the “in love” feelings have a shelf life, sometimes not very long. The wounded spouse may have influence if s/he begins to employ behavioral consequences, to the point in which the cheating spouse is in grave danger of losing a great deal. The wounded spouse acts, as s/he has never before. As you can see, infidelity is exceedingly complex. And the act of infidelity stirs powerful feelings. Rather than being lost in knee-jerk feelings and reactions, it pays handsomely to stand back, evaluate the type of affair and with power and new-found confidence try on some new behaviors that might significantly stop the affair. Overcoming Infidelity: It is NOT Your Fault!